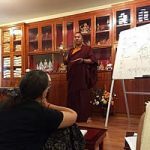 We are delighted to report that the 2018 Mindrol Lekshey Summer Program is underway at Lotus Garden. 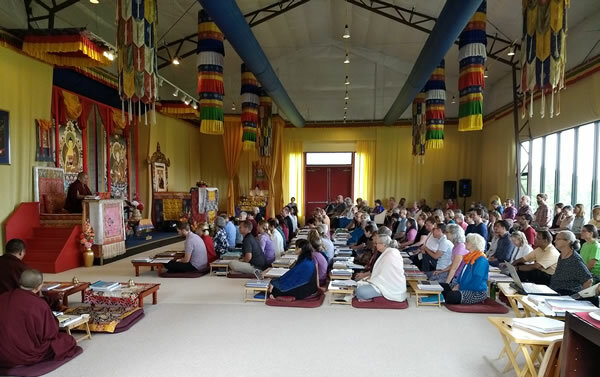 A sequence of rainy days did not dampen the devotion and enthusiasm of the students who packed the shrine room for teachings by Her Eminence Mindrolling Jetsün Khandro Rinpoche. 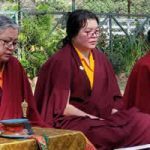 Rinpoche continues her teachings entitled Natural Ease with the aspiration that all levels of students could join together to receive the blessings of the wisdom teachings of the great master, Longchen Rabjam. 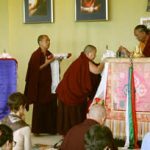 Following the conclusion of the Natural Ease section, Lotus Garden will extend its most heartfelt welcome to His Eminence Dzigar Kongtrul Rinpoche who will continue his profound and precious teachings on the Guhyagarbha Tantra. 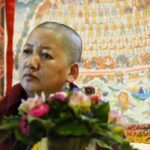 We are pleased to also welcome Dungse Jampal Rinpoche who will be receiving these sacred teachings along with the Lotus Garden sangha. 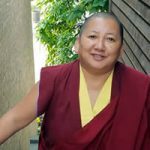 A special highlight of the next few weeks will be a special program titled – Understanding Body, Understanding Mind with Dr. Tsewang Rigzin, chief physician of the Men-Tsee-Khang Tibetan Medicine Clinic at Mindrolling Monastery. 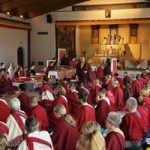 The Summer retreat then continues with four lively weeks of instruction, practice and study with the senior monks of Mindrolling. 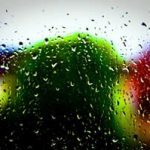 This is open to all who wish to attend. or by telephone at 1-540-778-2405. 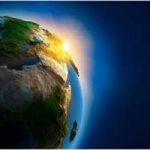 There is still time for anyone to register for the Tibetan Medicine and Language and Ritual Study sections. The Guhyagarbha section is restricted.